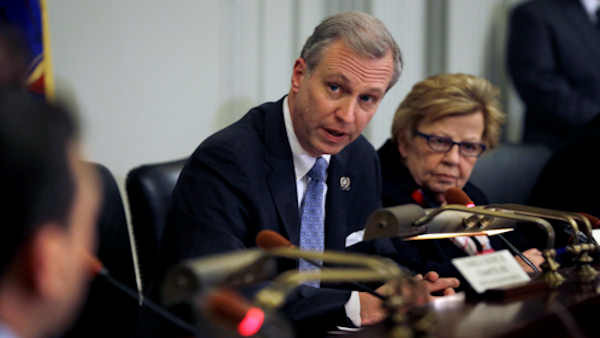 TRENTON, New Jersey -- New Jersey Democratic Assemblyman John Wisniewski announced Tuesday that he is running governor in 2017. Wisniewski, a member of the Assembly since 1996, is known for co-chairing the legislative inquiry into the 2013 George Washington Bridge lane closures and has been a pointed critic of Republican Gov. Chris Christie. In an email headlined "I'm running for Governor of New Jersey," Wisniewski on Tuesday called for policies that work for "everyone in our state" and backed an increase in the minimum wage from $8.38 an hour to $15 an hour. "I believe men and women have the right to go to work every day with dignity and for a minimum wage of not less than $15 an hour," he said. He joins Democrat Phil Murphy and Republican Assemblyman Jack Ciattarelli who have also announced their candidacies to succeed Christie, whose term ends in 2018. Murphy, a former Goldman Sachs executive and Obama administration ambassador to Germany, is in strong shape for the June 2017 primary. He has loaned his campaign $10 million, gotten the support from key Democratic Party chairmen across the state as well as Jersey City Mayor Steve Fulop, who was himself a prospective 2017 candidate before dropping out and backing Murphy. Wisniewski took a veiled shot at Murphy in his opening email. "I'm not a Wall Street executive. I haven't made hundreds of millions of dollars by outsourcing jobs. I've learned the value of public service," he said. An attorney from Sayreville in Middlesex County, Wisniewski served as state Democratic committee chairman in 2010. He also served as Vermont U.S. Sen. Bernie Sanders' New Jersey chairman during the 2016 Democratic primary before backing Hillary Clinton. He was frequently in the headlines in 2014 related to the inquiry into the bridge scandal. The committee he co-chaired with Democratic state Sen. Loretta Weinberg did not find evidence directly linking Christie to the scandal, and the governor was never charged and denies any wrongdoing. The federal trial in the case concluded recently with the convictions of two former allies of Christie, and with Wisniewski calling on legislative leaders to re-open the investigation. They have not done so to date. Wisniewski also said Christie misled the public, based on testimony at trial that he knew about the scandal before he publicly said he did, and said he wouldn't be truthful unless under oath.